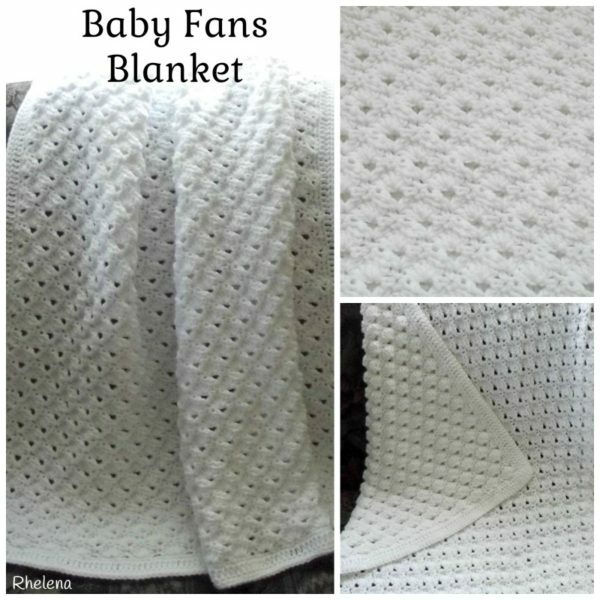 This fan stitch baby blanket has a gorgeous texture to it on both sides of the fabric. The fans curl a bit creating a small bump at the back, while creating a lovely texture at the front as well. The bumps at the back remind me of white puffy clouds floating in the sky. The finished size measures about 31.5″ square. It’s the perfect blanket for a newborn boy or girl. 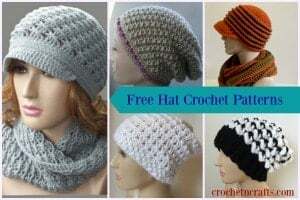 Crochet it in a single color as shown, or go for some pretty stripes. For some reason I had problems with the edging. The first time around I crocheted it using the same hook as I had used for the blanket, but it ruffled a bit. I figured a smaller hook might work, but it still didn’t lay flat. My next possible solution? I blocked it. Call me a cheater, but it worked. Hope you enjoy. Yarn: Loops and Threads Snuggly Wuggly Big! (14oz), Or any sport (3) yarn. V-St: (Dc, ch 3, dc) in the same st as indicated. Small V-St: (Dc, ch 1, dc) in the same st as indicated. Edc: Yo, insert around post indicated, yo and pull through (3 lps on hk), yo and pull through 1 lp, (yo, pull through 2 lps) twice. Here is a photo tutorial. Note: This blanket needs to be blocked for a nice edge. Dampen the blanket and lay it flat on a few towels. Pin it in place and allow to dry. Do not flatten the beautiful textures, the main focus of blocking is around the edge. With G hook, Ch 134 or any multiple of 6 + 2. Row 1: Sc 2nd ch from hk, *sk next 2 chs, 5 dc in next ch, sk next 2 chs, sc in next ch, rep from * to end. (133 sts) Turn. Row 2: Ch 4 (counts as first dc and ch-1), dc in same first st (small V-st made), sk next 2 sts, sc in next dc (center dc), *sk next 2 sts, V-st in next sc, sk next 2 sts, sc in next dc; rep from * to last sc; small V-st in last sc. (21 V-Sts (ch-3 sps) and 2 small V-Sts.) Turn. Row 3: Ch 3 (counts as first dc), 2 dc in same first st, sc in next sc, *5 dc in center ch of V-st, sc in next sc, rep from * to small V-st, sk next dc and ch-1, work 3 dc in last st (3rd ch). (133 sts) Turn. Row 4: Ch 1, sc in first st, work V-St in next sc, *sk next 2 dc, sc in next dc, sk next 2 dc, V-St in next sc, rep from * to last 3 sts, sk next 2 dc, sc in last st. (22 V-Sts) Turn. Row 5: Ch 1, sc in first st, *5 dc in center ch of V-St, sc in next sc, rep from * to end. (133 sts) Turn. Rows 6-75: Repeat rows 2-5. Do not fasten off or turn at last row, but continue with edging. Rnd 1: With E hook, ch 1, sc evenly around working 3 sc into each corner; join with sl st in first sc. Rnd 2: Ch 2 (does not count as st), edc evenly around working 5 edc in each corner; join with sl st in first edc. Rnd 3: Same as round 1. Fasten Off. Add this to your Ravelry. Lovely pattern, but you neglected to mention how much – yardage/meterage – yarn is necessary. Sorry about that. I worked off one of the big balls that come in 14oz, and had a small amount left over. I LOVE this blanket!!! The stitch is so pretty! Thanks Susie! Pattern is added. :) I need to start doing these link-ups regularly… maybe once I’m more organized. Thank you for the invite. So glad you linked up! I hope you come by tonight/tomorrow and link up again.